At MPG, we’ve built our business around great presentations. We make them fun. We make them interactive. We make them educational, or thought-provoking, or heartwarming… whatever best tells our clients’ stories. And we make them every day. It’s what we do. It may not be what you do. But that doesn’t mean you can’t create a presentation that wows. By following a few presentation best practices, you can make your message engaging and memorable, whether you’re giving a talk to co-workers or delivering a keynote address to hundreds. First, know your audience. What do they want to learn from you? What do they already know (or think they know)? What kind of tone is likely to resonate with them? Are they super serious, or would they enjoy something lighter? Keep it short. We’ve found that the most effective presentations run about five to eight minutes. Choose no more than three key points, and direct your audience to supplemental materials like a website if they want to learn more. Keep it simple. Look for a “hook” that captures your main message, then repeat it several times, both visually and in your script. Feel like you’re diving too deep into a topic? Trust that instinct! Better to leave them wanting more, than let them walk away numb from information overload. Let your visuals do the work (but not all of it). Your audience should be paying attention to you, not trying to read your PowerPoint slides. Choose visuals that complement what you’re saying, rather than repeat it. Think bold single images vs. tons of bullet-points. Break it up. Hold your audience’s attention by incorporating other voices and infusing freshness wherever possible. If you can weave in video, GIFs or animations, do it! Dual presenters, or an interview format, can help as well. Involve the audience. Invite them to play a game. Poll them, either with technology or a show of hands. Get them shouting a catch phrase, or out of their seats doing some simple dance moves. People are more likely to remember an experience that engaged vs. a dry lecture. Practice, practice, practice! Finish your script and polish your visuals with plenty of time to rehearse. We offer presentation coaching to help you be your very best. When you’re at ease, your audience will be more likely to trust you and remember what you’ve shared with them. Instead of crafting your own presentation, why not let MPG do it? 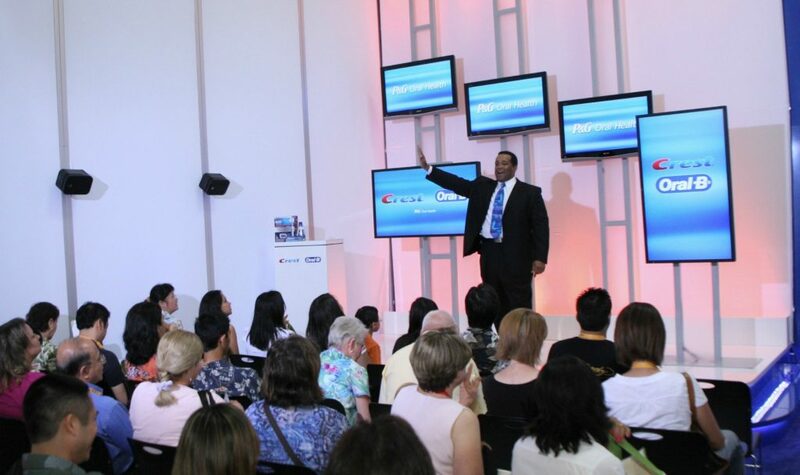 We’re experts at professional interactive, multimedia presentations for events of all sizes. Contact us to chat about how we can help put your message in the spotlight.